DJ Chuha is Steve from southern Germany. Chuha means rat in Hindi and is the companion of the elephant god Ganesha. 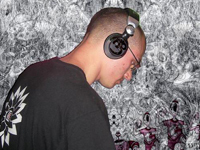 Steve is spinning psytrance since 2004 because he wanted to share his love to music with others. He quickly made himself a name in the Munich area and other parts of Germany. Soon he found himself playing in countries like Austria, Slovakia and India (Goa) and there are for sure more to come. Chuha is a part of the sportive Munich based label Spontaneous Aerobics which he joined in early 2006. Steve likes to play a wide range of psychedelic music. He has a weakness for well arranged melodic, emotional and energetic fullon wich is unique and well selected. On the other hand he loves deep, mystic and powerfull night-orientated psytrance with a darkish but never evil touch. Chuha also enjoys playing Ambient and Chillout tunes wich takes you on a trip around the globe may end in Bollywood.